Please be patient, we’re slowly undergoing a makeover. The new year is now in full swing. We have lots lined up this year. This will include various design and media projects, as well as new products and promotions in our online store! Keep checking back for more information and updates. We have now completed processing all orders placed during our 12 Days Of Christmas promotion. Thank you to everyone who shopped with us during this busy time. Every purchase, both big and small, helps us keep doing what we love, and drives us forward. We really appreciate your support. 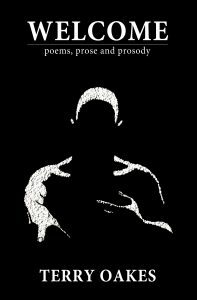 We’re now stocking paperback copies of Terry Oakes’s first poetry book. Welcome is now available in our store. It was a great pleasure working on the design and layout of this book for Terry. New prints and collections available in the store. 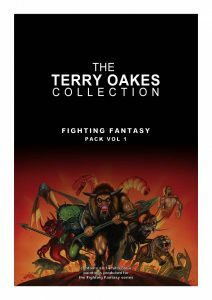 We’ve now finished working on all the cover images Terry Oakes created for the Fighting Fantasy series of game books, which are now available in the store as individual A4 and A3 prints, or as complete packs. 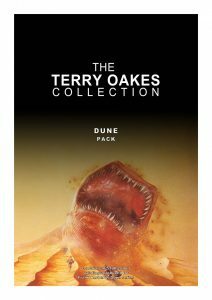 The Dune imagery by Terry has also now been completed, and like the Fighting Fantasy prints, they are available individually or in complete packs. Head over to the store to see more. We’re having a stock clearance. All products currently listed in the store will have 50% off throughout May, when you enter code MMC50 at the checkout. This code is valid from the 1st to the 31st May 2018. Hurry. Offer valid while stocks last! Our store is up and running. We have a selection of products available at present, which will be added to over time. 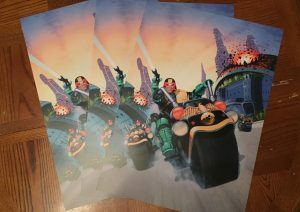 We are proud to announce the first selection of prints for internationally renowned illustrator Terry Oakes. Terry was a popular illustrator from the mid 70’s to mid 90’s, mostly working in the science fiction, horror, and fantasy genres. He was one of the most prolific illustrators for the Games Workshop, creating artwork for board games, promotional material, and the popular run of Fighting Fantasy game books and novels. Terry also created artwork for novels, such as Frank Herbert’s Dune trilogy, Stephen King’s The Shining, and Dennis Wheatley’s The Devil Rides Out. He also produced album artwork for Hawkwind, Vangelis, and The Exploited. Intercept Studios is currently going through some changes. Aside from a small business restructure, including the addition of three new fantastic members, we are currently busy working on several new internal projects. Some are film related, others are not. One of these is the development on an online store to sell various products and merchandise related to projects we and our affiliates are involved with. This will include music releases and merchandise for sister company ARK Records, and The Guilty Spark, and several new and exciting ventures with internationally acclaimed artist, Terry Oakes. Art and design for The Guilty Spark. We recently had the pleasure of working on the artwork for the upcoming album from Intercept Studios co-founder Andrew Oakes, aka The Guilty Spark. The album will be released on November 3rd. Available to buy digitally or on CD, and stream. 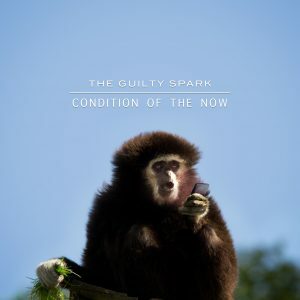 Keep updated with The Guilty Spark, and ARK Records! Intercept Studios were recently involved with a short film production for Impact50. The two minute short, titled Silence, tells the story of Sarah, a non-verbal girl with aspergers as she and her mother await the end of the world. Sarah calmly plays as her mother tries to help her understand their impending doom. Intercept Studios took on various production services for this powerful short film, including completing 23 visual effects shots, sound design, sound mixing, and film editing. Please help support this film. Comments welcome via the Vimeo link above.